RapidValue is a leading provider of end-to-end digital transformation solutions for enterprises worldwide. Its digital solutions span across mobile, cloud, IoT and omni-channels to help improve productivity, stream business workflow, reduce operational cost and achieve higher ROI. They won the Gold Stevie® Award in The 2017 International Business Awards for Marketing Department of the Year. 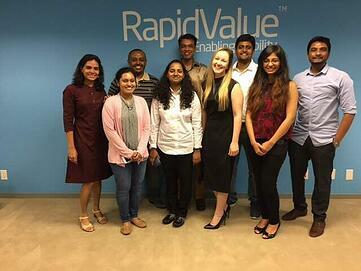 RapidValue, headquartered in Pleasanton, CA, in the United States, was founded in 2008 and has grown year-over-year since its inception. With eight global offices, 450+ employees, 600+ projects delivered and 15+ international global corporate awards, it’s safe to say recognition is in order. Kavyanidhi Narayan is the Marketing Manager at RapidValue and is proud of the attention the company is receiving for its hard work. RapidValue is also proud to have some of the world’s top brands, Fortune 1000 firms and innovative product startups as their customers. Kavyanidhi supports the pursuit of balanced work-life relationships. RapidValue is rich in culture with a diverse team, so celebrating all festivals throughout the year is important to them. Apart from leading the 17-member marketing team, Kavyanidhi is also an athlete and has won many championships in track & field events. She also has her own sports club for children called Galloper, which she pursues on the weekends. Kavyanidhi also believes that building the right relationship with stakeholders and working closely as a team is what brings success—not just for themselves, but also for the organization.